A groom was led away from his Pennsylvania wedding in handcuffs after allegedly sexually assaulting a teenage waitress and beginning a brawl. A groom was handcuffed at his own wedding for allegedly groping a teenager and exposing himself in a bathroom stall. 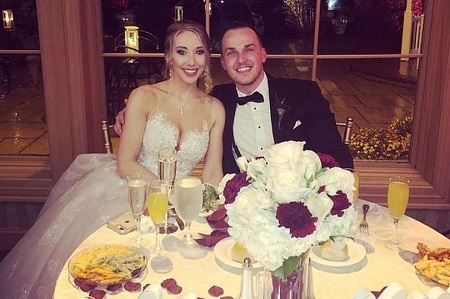 On Wednesday, Matthew Ronald Aimers, 31, of Willingboro, N.J., was arraigned on charges dating from his Nov. 24 wedding in Bucks County, Pa., as originally reported by the Philadelphia Inquirer. He was nabbed for harassment, disorderly conduct, indecent assault and exposure, as well as corruption and imprisonment of a minor. After saying “I do,” Aimers apparently scoped out an underage waitress working at his Northampton Valley Country Club wedding reception. According to a criminal complaint sent to Yahoo Lifestyle by the Bucks County District Attorney’s Office, Aimers propositioned her for a hookup, saying “we can do whatever you want.” When the employee said no, Aimers stalked her in the restroom, grabbed her arm and forced her into a stall, blocking the door with his body. During the alleged sexual assault, Aimers pulled down his pants and said, “Can you kiss me like you mean it?” and offered the victim $100 for sexual favors. She pushed him off and ran from the bathroom. In the complaint, Aimers then started “pushing and punching people” by the venue’s front doors. An employee told police he got punched because he stopped Aimers from bringing an alcoholic drink outside. Aimers jumped on a shuttle bus to avoid Northampton Township Police officers who were called to the venue; however, an officer with a Taser gun removed the groom. Aimers allegedly called the officer a “b***” and a “p****” and challenged him to a fight. Newsweek revealed that Aimers was freed from jail after paying only 10 percent of his $350,000 bail. For his behavior toward employees, Aimers was charged with simple assault and harassment. And for the altercation with the police, he faces disorderly conduct and resisting arrest. According to the Philadelphia Inquirer, Aimers had a preliminary hearing on Jan. 17 and his arraignment will be held in Bucks County Court next week. “He maintains his innocence, and he looks forward to clearing his name when this is all concluded,” said Busico.